Here’s how the story goes: You check into your hotel and are pleased to note the jazzy lobby signage. Up in your room, freshly painted and appointed, you hit the remote on the newly installed flat panel, and behold—the picture before you resembles an abstract painting of Siberia in January. What gives? At the new citizenM location in Times Square, the boutique hotel is using a Cloud Electronics DCM 1e, along with a wide range of Bose speakers, to create a mood with audio. The DCM 1e gives the hotel manager the ability to configure and control the entire system remotely from a mobile device or PC. Until recently, improving the quality of the picture and video meant wholesale replacement of equipment and infrastructure; certainly cost prohibitive to most. A trend both in North America and internationally is the emergence of ultra-nightclubs and day clubs such as Hakkasan and DayLight in Las Vegas—live music venues/restaurant combos that are bringing a high quality audio experience, he mentioned. With the music licensing process dramatically simplified in the last few years, integrators now have more options for motivating clients to go beyond the limited offerings of online music by expanding into music profiling. Several companies, he noted, are starting to pioneer music curation. “One such start-up is called RockBot. They have a music offering that allows for the typical playlist selection to be played as un-curated music. With a video screen in the venue, patrons can then start selecting songs to be played from their mobile device. If the patrons start ‘liking’ one patron’s music selections, that patron can become the virtual DJ for that venue. This gives you the advantage of a dynamically curated music experience based on the current customer based at that time. This is an offering that is available for easy installation for local AV integrators. Hotels looking to deliver a memorable stay for their guests are increasingly turning to audio as an indispensable tool. Past the architecture and interior design itself, there is no better way to inject a property with a specific mood than a unifying, distinct audio experience. This was the case at citizenM’s recently opened 230-room Times Square location. 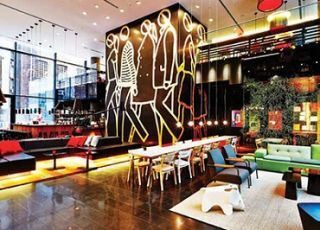 Headquartered in Amsterdam, citizenM is making a name for itself in the competitive boutique hotel market by appealing to the modern mobile traveler. With additional locations in Amsterdam, Glasgow, London, Paris, and Rotterdam, the chain’s aim is to combine an offbeat sensibility with affordable luxury, technology, and style. This was all made possible by a Cloud Electronics DCM1e at the heart of an audio system comprised of a wide range of Bose speakers, is. An ethernet-enabled version of Cloud’s popular DCM1, the DCM1e gives users the ability to configure and control the entire system remotely from a mobile device or PC. “It’s quite useful for the hotel managers to be able to control the sound system in this way,” Sexton explained. “They’re already controlling all their other systems— heating, ventilation, and lighting—from tablets.” The managers have backup override as well, so there is no chance of a low-level staff member or bartender throwing their iPod on and messing with the hotel’s meticulously crafted vibe. Which areas of hospitality are seeing the most demand for 4K, and how can integrators best sell this new format to hospitality clients? Panasonic 4K LQ70 Series Display While a sought-after technology, 4K deployments are still in their infancy across most vertical markets, including hospitality. However, we are starting to see increased interest in 4K displays in very high-end suites, as well as digital signage/ entertainment applications where a big impact is needed, such as in a casino or sports bar. Currently, the greatest barrier for adoption is that only a limited amount of content is available in 4K. Still, that is rapidly changing as more content providers are filming in 4K as a way to future-proof their recordings. Similarly, integrators should emphasize the value of an investment in 4K technology to hospitality customers that are considering an upgrade to their display systems over the next one to two years. Sony FWD-55X850B 55-inch ProBRAVIA professional 4K UHD display. Several areas across the hospitality market are suited to 4K, especially gaming and casinos— for example, in a sports book. Also, more and more theme parks are incorporating 4K imagery into many of their simulation rides. So, the 4K opportunities in hospitality applications are certainly great. Hotels and hospitality facilities need to consider several factors when deciding to upgrade the TVs and flat panels in their guest rooms, and the displays in lobbies, meeting and conference rooms, restaurants, or lounges. Essentially, any place on a property that would be receiving a signal is affected. Just like they did with HD, consumers are not just using their increasingly sophisticated 4K TV sets just to watch TV. They’re connecting gaming consoles, Blu-ray players, PCs, and other devices to their sets, streaming 4K content and more. So when these tech-savvy consumers travel—for business or pleasure—they now expect the same or better quality, connectivity, and choice of high-quality entertainment options in their hotel rooms that they enjoy at home. For integrators, helping a hotel choose a 4K display solution means much more than simply buying and installing new sets, and many of the issues were similar to the HD transition. Think of a hotel in Las Vegas, for example, that has 5,000-plus rooms. Each set in all those rooms needs to be connected and networked in order to receive the same services, including pay-perview and video-on-demand content. Hotels also need a way to easily update all the sets across a property, so each display is in sync; there are issues related to wiring, network connectivity and bandwidth that also need to be considered. It’s important to keep in mind that displays need to fit a room’s décor. Displays also need enough input and output flexibility to accommodate tuners, networking cards, or other optional boards. Planar EP5804K Touch display. At Planar, we see many 4K installations in restaurants, bar venues, and hotels. Many decision makers in these businesses find that video imagery of meal offerings, beverages, and services can lead to increased revenue. The customers’ visual experience is such an important factor in the hospitality industry. The realism achieved with 4K makes the experience even more visceral. An added advantage is that with the additional pixels and readability available with 4K technology, nutrition information, and other details (often required by state laws) is easier to display without detracting from the design and branding of menu boards or advertising. For entertainment purposes, as in a luxury sports bar, 4K displays can show four distinct 1080p sources simultaneously, then easily switch to scale one source across the entire display. This is a great feature when there are multiple feeds to watch or when the “big game” should dominate the space. This application can also extend to VIP suites at sports arenas and other private dining experiences. Another area where we are seeing a demand for 4K signage is in the healthcare industry. Wayfinding is a huge application in this space and can enjoy the same benefits as hotels. There is a growing use of displays used for decorative purposes or for procedure education and advertising, not only in hospitals, but also in medical and dental offices. BenQ’s 84-inch RP840G 4K UDH interactive display. We believe that 4K for the hospitality sector has the strongest appeal to event management and enhanced wayfinding applications. The ability to divide up a screen and have a window of highdefinition video feed at an event that can then be selected via a content menu is ideal for a 4K display. For traditional wayfinding—such as in a museum—menus can be enhanced via high-definition images for a more rich content experience where the user is able identify an area of interest based on images as well as text. Very soon after the introduction of larger format 4K technologies, the hotel industry responded rapidly by adopting it in a couple of key areas. LG 84-inch LED widescreen UHD 84WS70BS-B display. Hotel lobbies present a unique opportunity for branding and experiential impact. For example, Hotels are installing digital displays behind the counter to capture the attention of guests checking in with larger and more detailed images to help establish greater emotional and cognitive impact. A digital display that greets guests upon entry to a hotel creates a welcoming environment to help weary travelers calm down to a state of mind closer to what they feel when they arrive at home. And it also opens up a point of engagement to create a stronger brand impression and reduces perceived wait times at a point of the service engagement in which the customer is usually anxious to complete the process as quickly as possible. We consider hospitality as hotels and conference centers. We really don’t see a demand right now for 4K in this space. An area we see a lot of interest for 4K is the retail space—especially high-end/luxury brands. These customers want to display their fashion at the highest resolution possible for their flagship stores. For Samsung, UHD commercial displays in hotel lobbies capture guest attention, share information, and leave a powerful brand impression UHD commercial display technology opens up new possibilities for the hospitality industry to create impactful digital signage or video wall solutions that engage, entertain, and inform their guests. As UHD begins to gain ground in commercial environments, we see high-end hotel brands as among the earliest adopters. Whether it is in the lobby, restaurant, business center or other highly visible location, UHD displays paired with dynamic 4K content capture attention and leave a powerful brand impression. One common concern raised by 4K skeptics is lack of available content, but this argument is far less valid for hotels deploying digital signage than for consumers that are more reliant on UHD broadcast content. Creating video or animated content in UHD is well within the grasp of most creative agencies or even in-house art directors–in fact, 4K content can be recorded with remarkable clarity on our Samsung Galaxy S5 smartphone. It’s also important to point out the UHD displays can upscale existing full HD content–some more effectively than others–to make it look more vibrant and rich. The transition to UHD is underway, and we expect 4K to become the new standard in two to three years. So even if hospitality customers do not immediately plan to display 4K content, forward-thinking integrators should think seriously about spec’ing out UHD to future-proof their projects.